I have a problem with downloading this mod, always when I hit the download button nothing happens and it says that download will begin in few seconds. I don’t have any problem with my internet connection. Não inicia o download. alguém sabe porque? Can there be an ATS version please? having big issues with downloading. always getting a timeout with, the main mod and Winteraddon. can we download it from a better website or something. Yo ya pago para Mod ya descargar. ¿Pero como hacer donde? Ya me pago 10$ por Mod. Pero no funciona juego en el TruckersMP? Try posting on the TruckersMP forum, you might get better help there. This is annoying. Every time link just broke down in mid way. this is not fair to provide only for MP. I’m in contact with TruckerMP at the moment, apparently they will provide their own torrent link which will free up this link, maybe just wait a few hours and it should be fine to download. Hey Grimesmods, why is everything greenish? Recommended settings are set. It hasn’t installed properly, is this for MP or single player? Dieser Mod funktioniert bei mir nich, er lädt es zwar runter, aber es wird mir nicht als Zip. Datei angezeigt. Wenn ich ihn (wie beschrieben in den richtigen Ordner lege, passiert null. bei mir hat er scs datei geladen diese hab ich dann in den mod ordner bei ets2mp gezogen. hi grimes! i have a question: the physic mod must be on top of the base mod or under or doesn’t matter? thanx! It doesn’t matter, as long as you have it above any other physics mods you might have in your Mod Manager. Have you tried asking for advice on the TruckerMP forum. where i have to put the mods? For single player or MP? Hi Grimes, everything is greenish. Any advice, please . Thank you ! Is it for single player or MP? Please forget about my request, it s possible to conflict with other mod, Ive deleted profile and make new one its ok now, thanks ! Please help me, i put mod in mod folder and move it in game and when game load – it crashed.. ?? Make sure you’re updated to the latest version of ETS2, place Frosty on top in Mod Manager and disable any other graphics/weather mods, if it still crashes copy your game log file and paste it at pastebin.com and I’ll check it. Frosty isn’t compatible with Mario Map in case your using that. It does not come up in my mods. Please help! 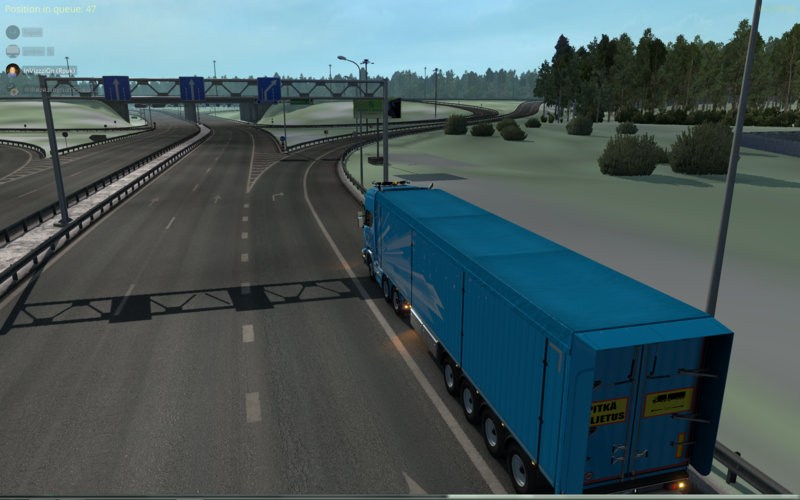 After downloading you should have a large file called Frosty_7_0.scs, place in your mod folder – documents/Euro Truck Simulator 2/mod. That’ll be an issue with the winter tire mod then. Seems to me that winter tires are pointless without proper wet weather physics being programmed into the game engine. As far as SCS is concerned, the vanilla game has perpetual summer and they haven’t programmed any wet weather physics whatsoever so any tweaks to the physics only reflect the conditions on a warm summers day. Even if you change the trailer and truck stability settings, it won’t change any further when it rains/snows. With this mod the roads become slippery, not quite as in reality but so close you can get. #7361. I have a problem. I downloaded in, then I put it in mod folder, didn’t change anything. Then I join the game and look up for Mod Manager. i don’t see any mods in it. I am playing it on MP. Please help, than you! Try posting on the TruckersMP forum, they’ll be able to help you there. Yes it is, place Frosty above those maps in mod manager, remember to download the ATS version of Frosty, not this version. Congratulations and thanks for letting my fun much more beautiful !!! How do I install this mod for Truckers MP, I never had a mod file and when I made one it didn’t work. Try posting at in the TruckersMP forum, you’ll get better help there. TruckersMP doesn’t allow mods. You have to play with the vanilla game or nothing. If a mod affects the game environment, it’s not allowed. You can’t have it snowing in your game and everybody elses game is in summer, as the SCS games are all year around. Try asking on the TruckersMP forum for help on this issue. TruckersMP and ETS2MP generally does not allow any mods that change the environment, because then you’d have some players having winter while most of the players are in the default summer. All players have to be in the same environment when interacting with other players, it’s common sense, really. When you use the Frosty Winter mod in single player, the game environment you see is yours and yours alone, but with MP, you could have hundreds of other players using the same space. Will you ever add this to the steam workshop? No, just on this website. Hi.Could you advise some winter sound mod,for your winter fashion? I think the Sound Fixes Pack has a winter version. great mod, but i have a question cause i’m not sure if its an issue or not, using this on the TruckersMP all fine, but in my Sp profile, there is no snowfall and it still “rains”. Any ideas? I’m using promods on the SP profile. cheers and keep up the good work. If you’re getting rain instead of snow that means there’s a conflict with another weather/graphics mod, make sure to disable any others. Make sure you also disable any other graphics mods as well, such as RGM for example, also place Frosty on top in Mod Manager, you can paste your game log at pastebin.com as well and I’ll check it. Thanks. I didnt see that. Is the ATS version supported by TruckersMP? No, just the ETS2 version. I operate in the area of south italy messina-palermo-catania-catanzaro, i found many trees on the asphalt. Could you please check? Hello, is there any way that this will work with Realistic Graphics Mod by “Frkn64”? I have downloaded all three files, but once ingame only “frosty heavy winter” and “frosty physics” show up. No “Frosty_7_0.scs”. Any help? If the main frosty file isn’t showing up in Mod Manager there may be a problem with it and you may may have to try downloading it again. The Frosty_7.0.scs file should be very large, almost 1gb in size, you should be able to open it as well and see the files inside. Is it possible to have a constant blizzard? What I mean by this is, I know that the snow is just the replacement for the rain. I know that in the options you can set the probability of rain to max which gives rain 100% of the time. The only thing is, the rain has varying intensity. So sometimes it’s just a drizzle, and other times it is a full on blizzard. Is there any way that we can make it blizzard 100% of the time? The only way you could do that would be to edit the weather files. Forgive my many questions. I’m not skilled in any way at modding (as my silly questions have already proved), but would that be a difficult thing to do, or do you know if it’s a big thing to change? Thanks again for your time. You’d have to open the Frosty mod, go to def>climate, in each of the folders there’s a bad.sii file, open it with notepad and change all the rain_intensity & rain_intensity to 0.8 then save. If you try this I’d make a copy first in case you mess up. I followed your instructions to the letter and this worked like a charm. Blizzard conditions 100% of the time! I’ve sent you $5 for your help and time! Without your mods, the experience won’t be the same. There is no way to get rid of the green snow! Play a single game. Disable all mods, create a new profile, does not help! Please help! Place the main frosty mod in Mod Manager and try that, if it doesn’t work then there may be an issue with it and you may have to try downloading it again. You can also copy your game log at pastebin.com and I’ll have a look at it. I did as you suggested. Downloaded and installed the mod again. Not help. It is very interesting that in Europe there are no problems with green snow. But in the Baltic countries and Russia, almost all the snow with a green tint. Unfortunately, I can’t copy the log. If you tell me how to do it, I will definitely do it. When it crashes post your game log at pastebin.com and I’ll take a look at it. When it crashes you need to copy your game.log.txt file and paste it at pastebin.com then post the link here. You’re using version 1.32 of ETS2, Frosty 7.0 is only compatible with 1.33, if you want to stay on 1.32 you’ll have to use Frosty 6.8. There isn’t a no bloom version but this mod greatly reduces the bloom already. With snow covered roads you’re going to get more glare from the headlights, that’s more an issue with headlight settings than hdr. Today I discovered some error in the highway in Germany, betwen exit toward Duisburg and exit to Dusseldorf. More or less in the middle of the highway between two exits there is error of connecting part of the road and all vehicles desappear suddenly. My truck came down and was fall in emty space, then destroyed. I tried to go there several times and it always happen again, so I`m sure it`s kind of error. If You want to know detail just contact me please. Anyway thank You for so nice mod!!! I would think road connection issues are caused by map errors not graphics mods, try the same area without this mod and see if the same thing happens. I see, but I have no other map mods. I use only SCS original nad DLC maps. Do You think it may be problem of original map? Try the same stretch of road without this mod and see if you get the same problem. Are both ATS and ETS2 on Version 1.33 now ? It appears pretty much all your mods are ready for Version 1.33. I get confused with their constant updates. Yes they’re both on 1.33 at the moment, usually you get an update every 3 months so next one will be probably be in March. After today’s game update to version 1.34, the mods began to cause the game to crash. When does it give an Version for 1.34 please? Hi, it crashes game while loading in 1.34. Any ideas, or is there a new version of the mod coming? Thanks! is 1.34 going to come out any time soon?